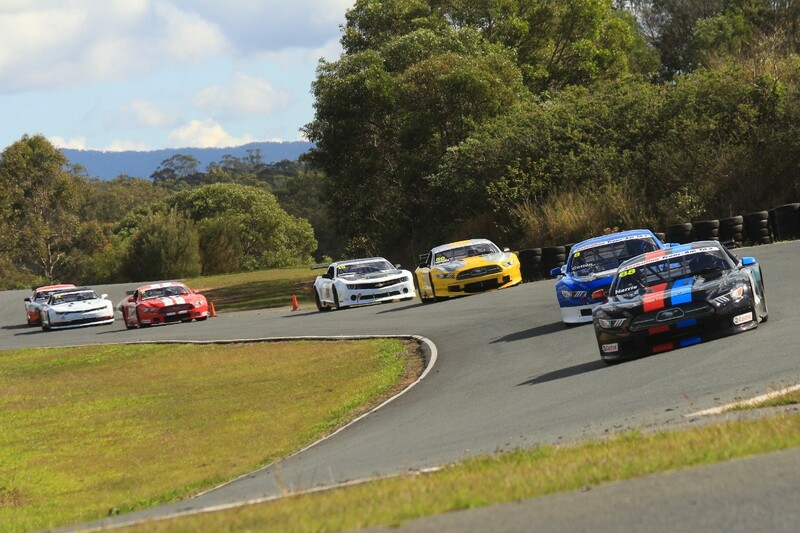 The 2018 Performax Australian TA2 Muscle Car Series heads north to Queensland Raceway for the first of three visits to the Ipswich circuit this year, with a 15-car field lining up for round two of the series at the Ipswich Festival of Cars on April 20-22. After scoring a clean-sweep of all four races at the series opener at Winton, Ashley Jarvis returns to his home track in a new car, taking the seat of the #10 Dodge Challenger usually campaigned by Peter Robinson who misses this round due to overseas commitments. Filling the seat of Ashley’s #22 Camaro will be his father Paul Jarvis, who has previously raced in local Saloon Car competition in his family-run team. Hoping to build on his series lead from round one, Jarvis praised the mechanical parity of all cars in the series and plans to be on the pace in the Dodge reasonably quickly. “There is no difference between the Camaro, Mustang or Challenger on track, so it’s just a matter of setting up the gearing and suspension to suit the driver,” said Jarvis. “We couldn’t have had a better start to the championship at Winton, so I hope to continue that run of form heading to my home track. The series also welcomes a new face to the grid in Queenslander George Kulig in a Chevrolet Camaro. The former Sports Sedan racer will debut the car at Queensland Raceway before his son Michael takes the reigns in a part-time program this season, in preparation for a full-time assault at the championship in 2019. “The first race in the TA2 series is exciting for us as a team, but personally it will be a learning curve and I will use this time to collect some basic data and to stay out of trouble,” said Kulig. “The rest of this year will be used to get Michael settled and used to a totally different tyre and brake package from his previous race car. Category management has reported strong growth since the launch of the national series, with a further three cars sold following the opening round at Winton. The Performax Australian TA2 Muscle Cars are set for four races over Saturday and Sunday at Queensland Raceway, in support of the Willowbank 300 endurance race.